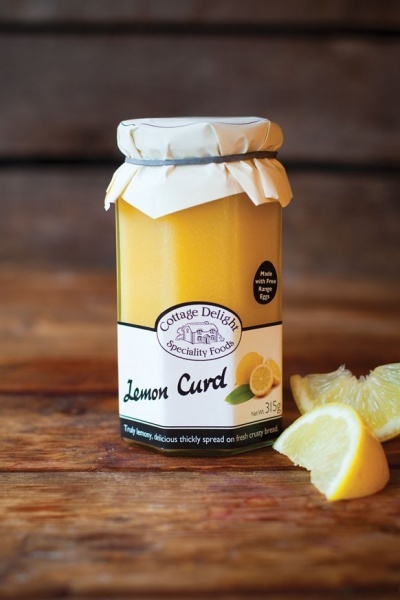 Cottage Delight Lemon Curd is award winning and made using free range eggs. Traditionally handmade in small batches, Cottage Delight's Lemon Curd is truly lemony, and delicious when thickly spread on fresh crusty bread. Try Cottage Delight's Lemon Curd as a filling for fruit tarts and sponge cakes, to create a lemon meringue pie style dessert or lemon sponge pudding. INGREDIENTS: Sugar, pasteurised free range whole egg, vegetable margarine (Palm oil, Palm kernel oil, Rapeseed oil), Water, Salt, Emulsifier: Polyglycerol esters of fatty acids, Natural colours: Annatto Curcumin, Flavouring), Lemon juice, Lemon oil.